What Is All-on-4® Dental Implants? Implant supported dentures are a method of tooth replacement that uses dental implants to anchor the full-arch restoration securely in place. All-on-4 is a specific implant denture technique that can offer many advantages over traditional dentures. By strategically placing four dental implants in the gums of each arch, Dr. Todd Mabry and Dr. Anna Vaysman can use All-on-4 to restore the form and function of your smile with beautiful results. All-on-4 also allows patients to speak and chew with confidence, knowing that their dentures are securely held in place. For patients with insufficient jawbone density who are not good candidates for a full set of single-tooth implants, All-on-4 can provide many of the same benefits without the need for bone grafting. Some patients who choose All-on-4 implant dentures are replacing missing teeth for the first time while other patients are seeking to upgrade their traditional dentures. The best way to discover if you are a candidate for All-on-4 is to schedule a consultation with an experienced dentist. What Should I Expect During the All-on-4 Procedure? The All-on-4 procedure is completed in two main stages. Using a customized surgical plan, the oral surgeon or periodontist will place four dental implants in the gums to ensure a comfortable, secure fit for your new denture. Two dental implants are inserted on either side of the front of the mouth; two additional implants are placed on either side of the back of the mouth, angled toward the rear. This positioning is used to optimize stability. Over the course of several months, the dental implants will fuse to the jawbone, providing excellent support for the denture restorations. While waiting for the fusion to complete, temporary restorations may be worn. The second office visit will be at North Scottsdale Dental Studio with our experienced dentists, during which you will receive your permanent implant dentures. Each All-on-4 implant denture is custom-made for a natural appearance. In some cases, your dentist may recommend a technique called All-on-6. All-on-6 is a modified version of the All-on-4 technique and can benefit patients with minimal jawbone density. Upper arch replacement is performed when the patient needs all of the teeth in the upper arch replaced. To secure the restoration, four dental implants are placed in the gums of the upper arch. When the patient requires all of the teeth in the lower arch replaced, lower arch replacement is performed. This involves the placement of four dental implants in the gums of the lower jawbone to secure the restoration. When both arches of teeth need to be replaced, a full mouth restoration is recommended. Four dental implants are placed in each arch of the mouth for a total of eight dental implants. 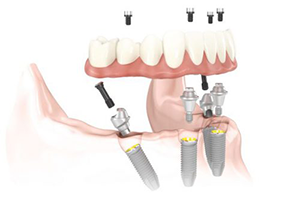 The All-on-4 dental implants procedure is customized to suit the needs and goals of each individual patient. As a result, there is no set cost for the procedure. Factors that can impact the total price of All-on-4 may include how many arches are replaced, the number of implants needed, materials used for the restoration, and the overall complexity of the procedure. Your dentist can give you a quote based upon your customized treatment plan at the conclusion of your preliminary consultation. At North Scottsdale Dental Studio, we offer a number of dental financing options that can provide qualifying patients with low monthly payment plans.